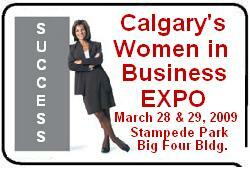 Calgary's Annual Women in Business Expo taking place on March 28 & 29, 2009 at Stampede Park - Big Four is designed for women entrepreneurs, opportunity seekers, work-at-home moms and women re-entering the workforce. Exhibitors offering products, services, opportunities and resources to help women reach that next level of success. Included is over 8 hours of seminars presented by women business leaders. All seminars are free to attend with the price of admission $10.00 at the door. It's a don't miss opportunity for women in business or women thinking about starting a business. Barry's Response Good luck with the upcoming event. Hi there choose the t shirts It becomes quite a lot comfortable to stretch the body in such easy and lightweight clothes I’ve been on the hunt for a summer t shirts and have been failing in my search, until now! The boom in home based businesses for women could be due to the fact that more women want to be able to stay at home with their children without sacrificing a career. Many want more flexibility, independence and control, instead of being told what to do. It is a way to escape the glass ceiling of the corporate world. Sounds like a great event! I'm trying to launch my own business and find this very interesting. Thanks.